Months ago I received an email from John H, asking me if I would be interested in a Groupon for a double date. 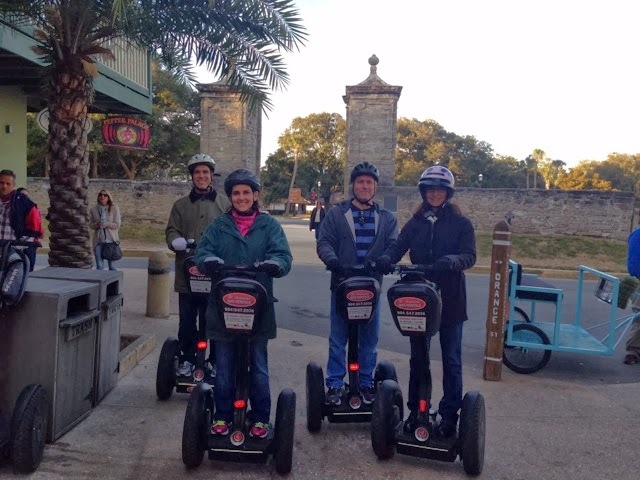 It sounded like fun, the price was reasonable, and I’d never been on a Segway! We presented the certificates to our spouses as Christmas (Denise) and birthday (Michael) gifts and finally settled on a date in January. Between John’s call schedule and Michael’s travel schedule, it was tricky finding a date that would work. We finally picked a Sunday afternoon. We met up at the bike rental location on King Street. Turns out there was one other couple from Atlanta that was part of the tour. 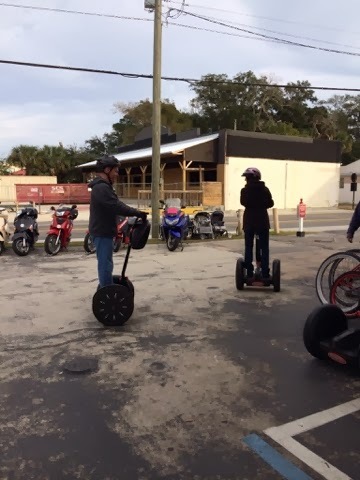 They had Segwayed before so they were considered the old pros. After a brief explanation of how to mount, steer, and dismount, we took turns getting on and practiced starting, turning, stopping and getting off. 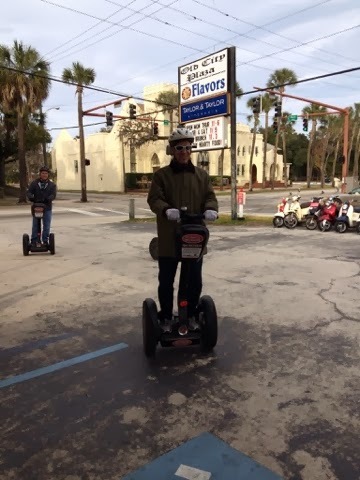 After a few minutes of wheeling around in the parking lot, we were off! 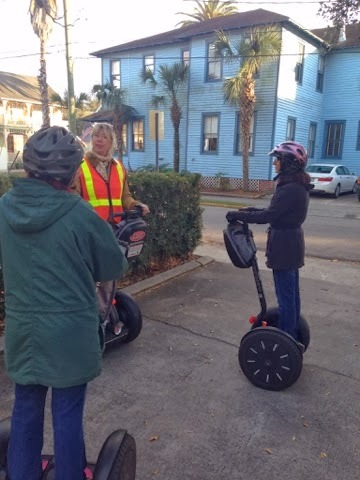 Sandy was an excellent guide, very friendly and very knowledgeable about both the Segways and the history of St. Augustine. She took us throughout the city, taking us down little back roads that we didn’t even know existed! We learned about Henry Flagler and the buildings he built, about Flagler College, about the Spaniards and the town they built, and about the runaway slaves that joined the Spanish settlement. 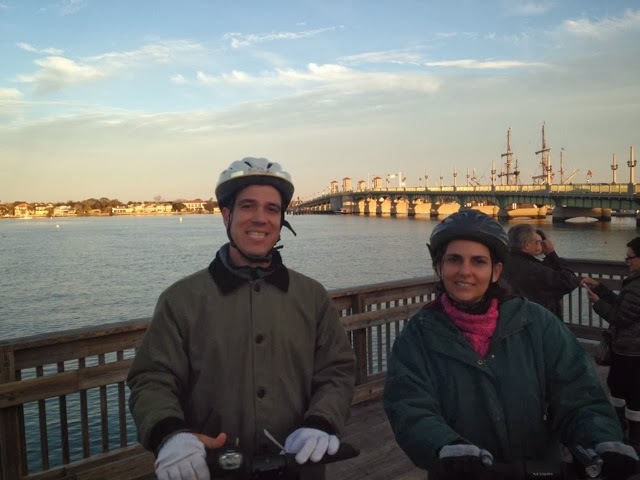 We rode along the sidewalks and in the streets and up on the sea wall. It was growing dark by the time we headed back. We were able to see a little of the “Night of Lights” as we rolled through the square in front of the Lightner Museum. Oh, remember The “experienced” couple? He took a fall near the end, and the wife ran into Michael as she turned to see what had happened, so she took a tumble too! They were okay, just a little bruised, hands, knees and ego. 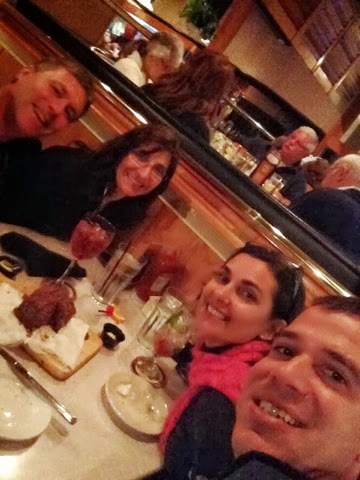 We had a wonderful time, followed by dinner at the A1A Ale House. The dinner was okay, not spectacular. 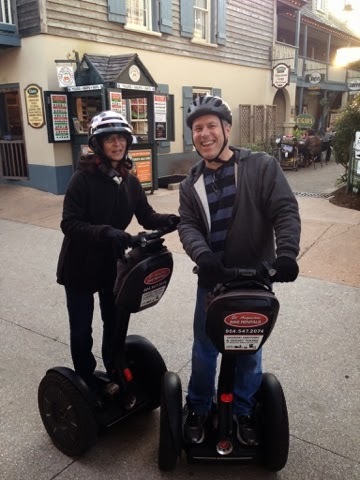 But it was delightful to share what we enjoyed about the experience and to thaw out! 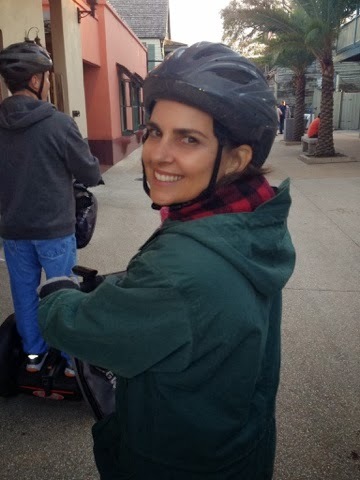 It was pretty cold after over an hour riding around! Thanks Louise! You’re missed too!